this week, kaeotalai nonglong & his ensemble bring us some beautiful sounds of lanna! alexandra picked this one up for me on one of her trips to the north, and it's almost certainly my favorite recording of northern thai folk music. 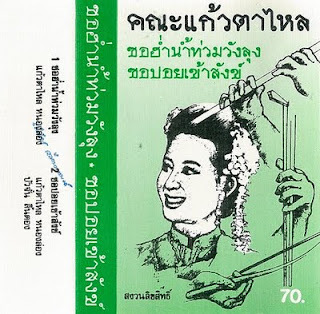 the recording is very intimate & raw; alot more engaging than much of the over-produced lanna music on the market. mr. kaeotalai (a.k.a. talai kanthachan) is from lamphun province and leads his ensemble on so fiddle & vocals. he is joined on side two by fellow singer ms. buanchan lintong, and together they are supported by a pi koy (small free-reed flute) and sueng (northern-style lute). a really exceptional recording, hope you enjoy! beautiful sounds. thank you for sharing! This is fantastic! Really enjoying exploring your posts! Many thanks.